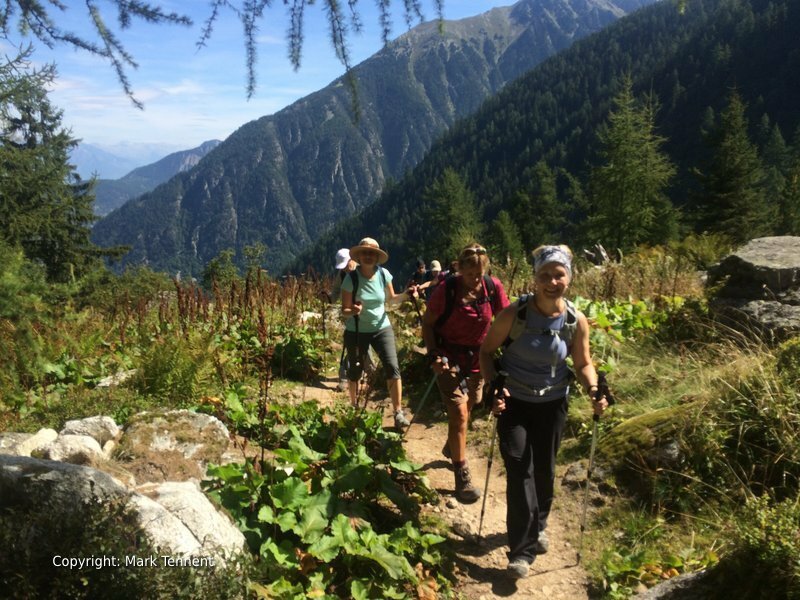 7 days trekking in the superb French Alps. 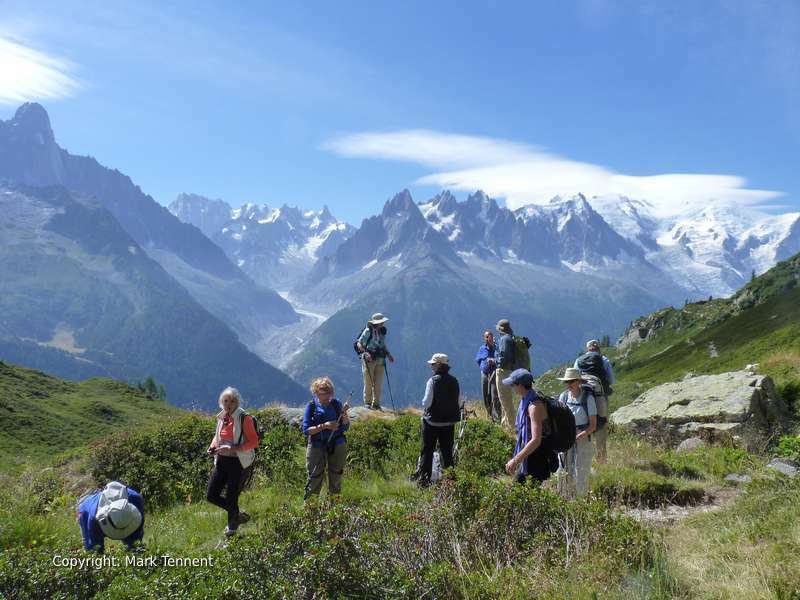 The Tour du Mont Blanc appears in the “Top 50 Treks of the World”. The TMB goes through three countries, France, Italy and Switzerland. The usual starting point for the TMB is the town of Chamonix-Mont Blanc. Chamonix is considered to be the “World Capital” of alpine mountaineering. 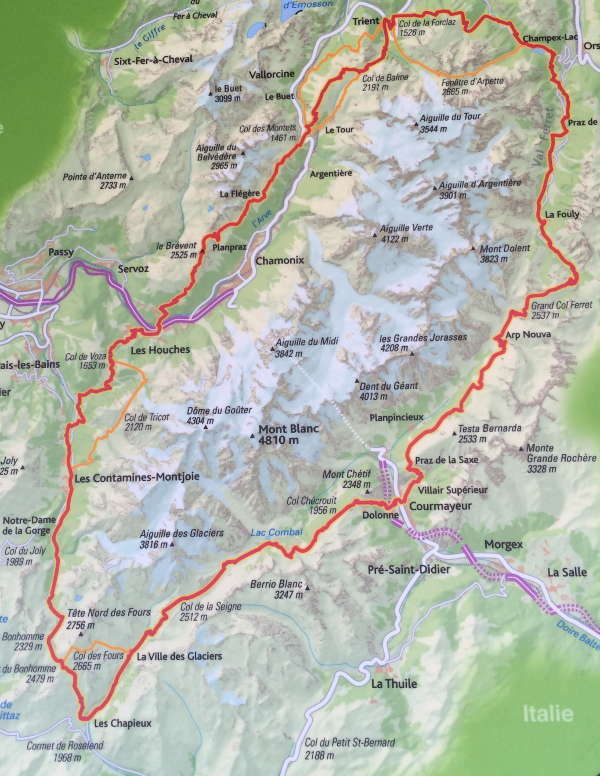 The route passes through eight valleys on its way: the vallee de l’Arve (often known as the Chamonix valley), the val Montjoie, the vallee des Glaciers (Chapieux and Les Mottets), the val Veny, the val Ferret (Italian), the val Ferret (Switzerland), the val d’Arpette and the valley du Trien (Switzerland). 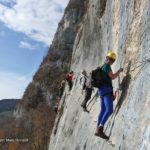 There are numerous variations of the TMB some of which are much more physically demanding. Part of the TMB follows the the GR5 (that starts at the North Sea and finishes at the Mediterranean). Part of the route is also used to join the Haute Route going from Chamonix to Zermatt in Switerland. Mont Blanc is the highest mountain in Western Europe at 4808m. It gives its name to the Mont Blanc massif which straddles the French-Italian border. 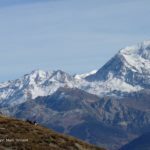 Our Tour du Mont Blanc takes in the “Highlights” of the TMB. This allows you to fit the tour into a one week schedule. The footpaths thread their way through lush alpine pastures (alpages) ablaze with a magical carpet of alpine flowers with panoramic views second to none. The first Tour du Mont Blanc was probably completed by Horace-Benedict de Saussure, a Swiss naturalist who undertook a dozen trips to Chamonix to look at the Mont Blanc massif. The Italian Val Ferret and the southern flanks of the Mont Blanc massif. The first ascent was by Jacques Balmat and Doctor Michel Paccard on the 8th of August 1786. The Tour du Mont Blanc in its entirety is approximately 170 km, 10,000m of ascent. It is normally walked in an anti-clockwise direction over 7 to 10 days. It has also become famous for the annual trail running race, the Ultra-Trail du Mont Blanc. Saturday – Transfer from Geneva and transfer to first nights accommodation. 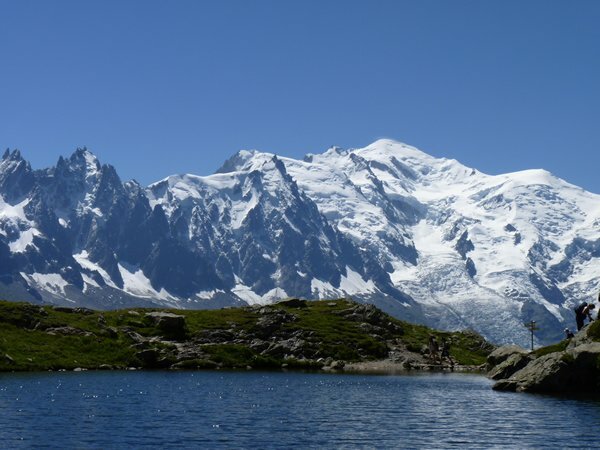 Sunday – Today we hike in the Aiguilles Rouges on the opposite side of the valley to the Mont Blanc massif. It gives an exceptional view of the famous Chamonix peaks. We will take the cable car to La Flegere from the hamlet of Le Praz. Classic views from the path that traverses the range. A final descent on foot or more quickly by cable car takes us to the world famous town of Chamonix-Mont Blanc and the bussling streets full of tourists and alpinists surveying the spectacular peaks. 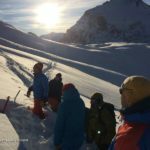 Monday – We take a short journey transfer to the village of Les Houches about 15 minutes from Chamonix. Another journey by cable car whisks us up to the Bellevue where we start our walk. Crossing over the Tramway du Mont Blanc we follow a footpath that traverses the hillside. Overnight at Les Contamines. Tuesday. We start today’s walk at Notre Dame de la Gorge. 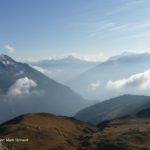 We hike up an old track that leads us up towards La Balme and a chance for a morning coffee or drink. From here we head to the Col du Bonhomme. A rising traverse across the mountainside brings us to our high point of the day, the Col de la Croix du Bonhomme. A short descent takes us to the Refuge de la Croix du Bonhomme and a chance for a drink or a home-made tart or cake. The onward trail descends now to the hamlet of Les Chapieux nestling below soaring mountain peaks. Wednesday – Leaving Les Chapieux we pass the farms at La Ville des Glaciers and Les Mottets before the day’s climbing really begins. The views open out as we gain height and eventually we arrive at the French-Italian border at the Col de la Seigne. Time for a drink and to drink in the views. 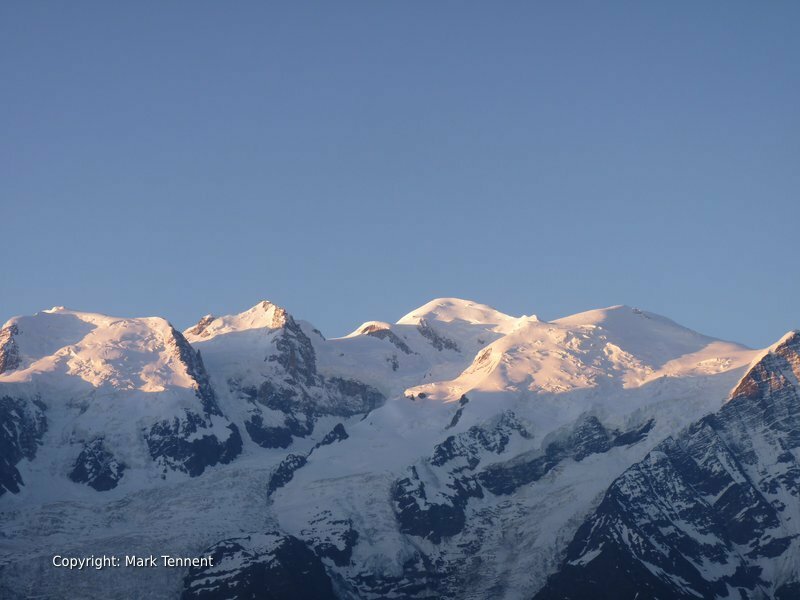 The southern ramparts of Mont Blanc stand majestically above us. Onwards into Italy and we pass the Refugio Elisabetta dwarfed below the flanks of Mont Blanc. We eventually reach a track and passing by Lac Combal we arrive at the road-head. A short transfer to the town of Courmayeur. Thursday – From the Refugio Elena our next goal is the Grand Col Ferret (2 537m) and the Swiss frontier before making for the pretty village of La Fouly. A transfer using the Swiss Postbus now takes us to the village of Champex. Overnight in gite at the start of the Arpette valley. Friday – Today we make for the Fenetre d’Arpette (2850m) which offers a spectacular view of the Trient glacier as we parallel it’s descent to the valley. Alternatively we will take the so-called Bovine route that climbs round the flanks of the mountains to reach the Col de la Forclaz. 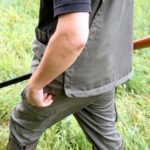 Saturday – France beckons once again. Leaving from Trient we start our climb back to France. There are a number of possibilities but our goal is the Col de la Balme and the Swiss-French border. A magnificent panorama unfolds with a view down the Chamonix valley and the peaks of the Mont Blanc massif spread out in front of us. Sunday – Transfers from Chamonix to Geneva airport. Accommodation: Huts (shared dormitory type rooms); Gites – Dortoir; Refuges, Hotels (twin rooms).